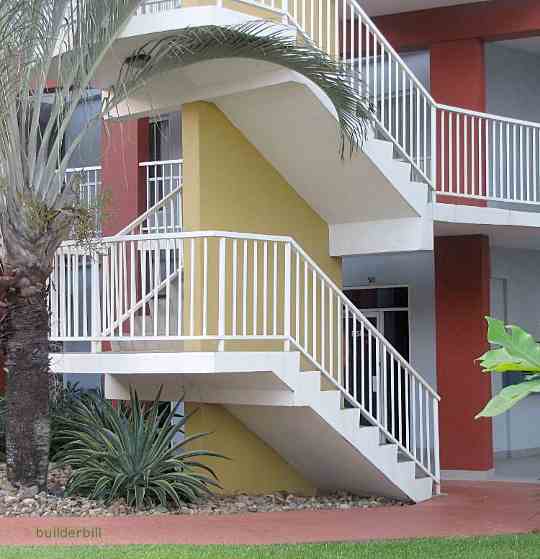 A stair that contains a series of steps that are supported at one end only. A beautiful old masonry stair seen at Hampton Court Palace. It is a so called cantilever stair. It is not a true cantilever, the term floating stair would more correctly describe it. Stairs like the one above do not cantilever or hang. They are often only embedded in the wall 125 or 5"
If the embedment was the only thing supporting them then they would soon fall. They do not get any real support from the handrails. The riser section of each tread bears on the back of the tread below it and so on down to the floor. Stepping on a tread passes the load to the step below and so on down to the floor. 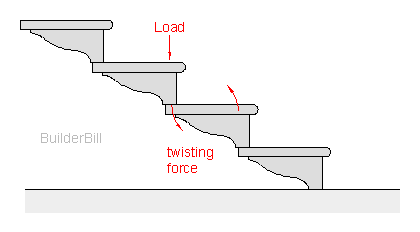 The treads when under a spot load as shown in the sketch want to twist or rotate but they cannot do this as the embedment in the wall resists it. So the load is transmitted to the next step down and so on to the floor. Think about it this way, imagine matchboxes under three corners of a book. It will balance OK but it will not hold any weight on it without tipping. Now imagine something gripping the short end to stop it twisting. 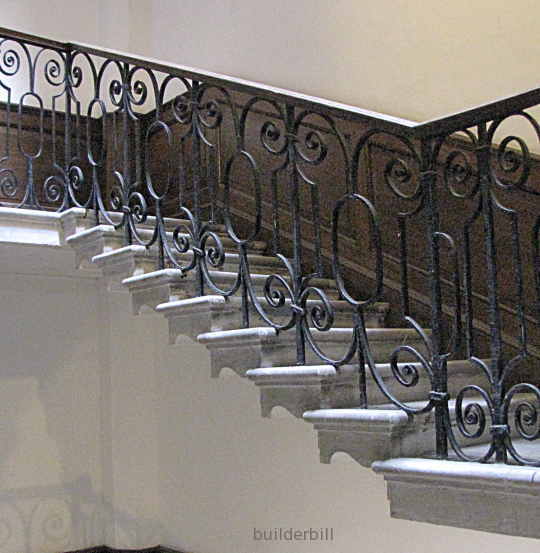 It is this resistance to the twisting force rather than the depth of embedment is what holds these stairs up. These are not cantilever stairs either. The beams that are supporting them are, they are cantilevers off the central wall. True cantilevers are few and far between because there are other ways to do it that make them appear to be supported by almost nothing. See the next page in this series.